& Malvern Hill, lower right, to Dabbs House, upper left. Back on Route 5, we head west from its junction with Route 156, for approximately three miles, then turn right onto Turner Road. We follow Turner road (and cross Darbytown Road), until it stops at Charles City Road. We then turn left. We take Charles City Road for about one-half mile, crossing over Interstate 295, and then turn right onto Beulah Road. We follow Beulah Road as it zig-zags around the Richmond International Airport to Route 60, East Williamsburg road. At the stop light on Route 60, we travel diagonally across the intersection from Beulah Road to Route 33, Nine Mile Road. A sign on Route 33 marks this intersection as being the location of the Battle of Seven Pines. Proceeding down Route 33 about a mile, we cross the railroad tracks at Fair Oaks. Like Seven Pines, this battlefield, associated with the Seven Days battles, is non-existent except for a road side sign. About five miles after Fair Oaks, and five or six stop lights, we turn into the Eastern Henrico County Government Complex on the right. It is clearly marked. Directly in front is the Dabbs House. Known as High Meadows prior to the Civil War, the two-story brick structure was the home of Josiah and Mary Dabbs when the war broke out. 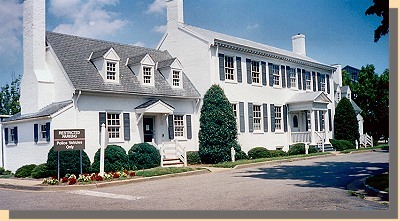 Upon the death of Josiah in January 1862, Mary moved into Richmond, leaving the house unoccupied when Lee made it his headquarters. An extension on the west and two one-and-a-half story wings were added in the early 1900s. -From the Virginia Civil War Trails Sign. In May 1862, Gen. George McClellan's Union army was poised on the outskirts of Richmond threatening the Confederate capital. Here, in the Dabbs House, Robert E. Lee, as new commander of the Army of Northern Virginia, opened his headquarters on June 1, 1862. Two notable conferences occurred here. The first, on June 11, brought cavalryman Gen. J. E. B. Stuart to plan with Lee the famous ride around the Union Army. That feat, which covered 100 miles in 72 hours, electrified stagnant morale among citizens and soldiers alike and was the first flash in Stuart's meteoric career. Almost two weeks later, on June 23, Lee assembled his top subordinates for the first time. Using information gathered from Stuart's ride, he unveiled his plan to drive the Northern army away from Richmond. This event, often called "The Dabbs House Meeting" was the first step in the series of battles known as the Seven Days that introduced Lee to the world as a talented general.